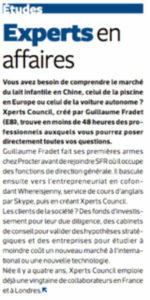 Xperts Council is really proud to be part of the ESSEC family, with its founder and CEO Guillaume Fradet! Here is an article from ESSEC Reflets, the ESSEC Alumni newspaper, on our young company. Click on the picture to read the article.